Growing wild amidst daffodils (off picture). A few white ones growing amidst more normal chequer-board patterned Frittilaries. Stem leaves are few, long, linear and grass-like. Flowers always dangle earthwards, one per plant. Besides the short leaves at the base of the single stem, two or three grass-like stem leaves emerge at various distances up the stem. 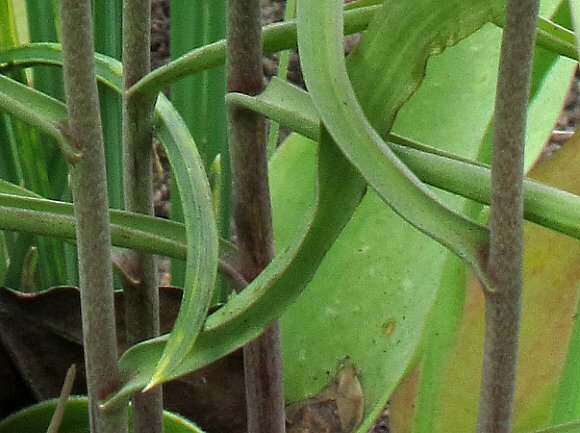 Some specimens have what appear to be two long 'horns' but these are just leaves near the top that happen emerge from the stem close together. Single flowers hang downwards from single stalks. 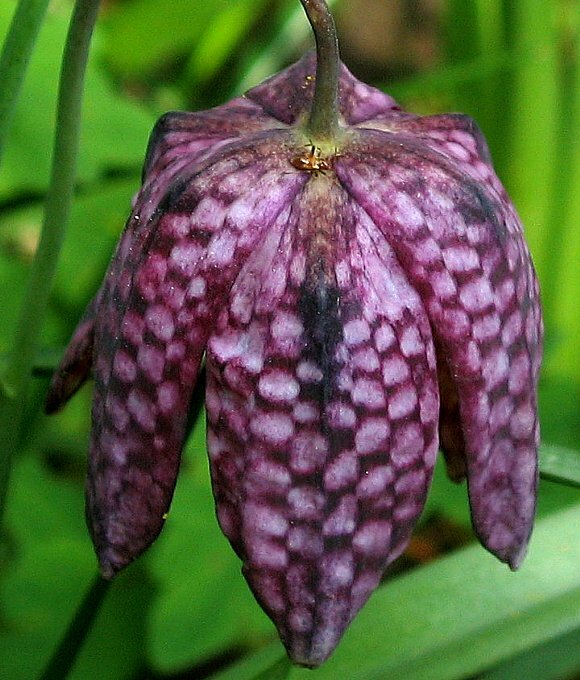 The petals are chequered with alternating dark purple and creamy white squares forming an unmistakabl and unique identifying pattern. Six petals, three on top, three underneath. The chequerboard pattern is mostly an illusion; the blotches are quite irregular, but apparently constrained to a square(ish) array. The centre of each petal may have a darker indigo blotch. where the hunches are. 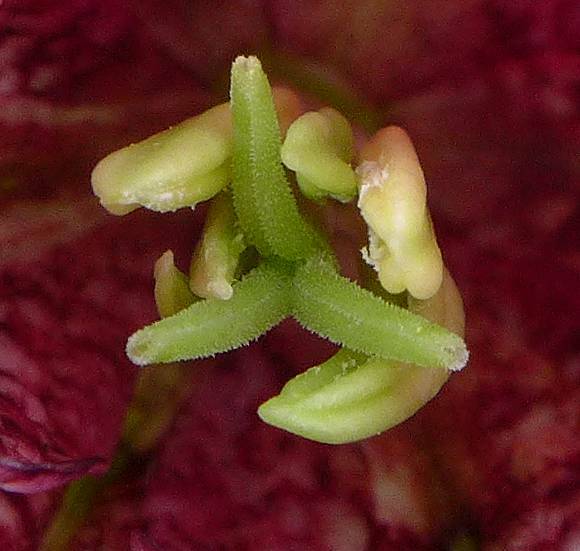 In the same place inside the flower is yellowish-green. Albino and cream-coloured specimens are common but lack the chequer-board patterning. A fortuitous missing petal allows a glimpse into the deepest innards of this albino specimen: A thickened green ovary which splits into a light-green three-pronged stigma Surrounding it are six shorter white stamens have long yellow anthers, shorter than the stigma. Like a decorative lamp-shade which your Author would love to have in his living room. There are light-green patches on the inside of the petals where outside are darker indigo blotches positioned just where the 'hunches' on the outside are sited. The three-pronged stigmas are angular in cross-section. 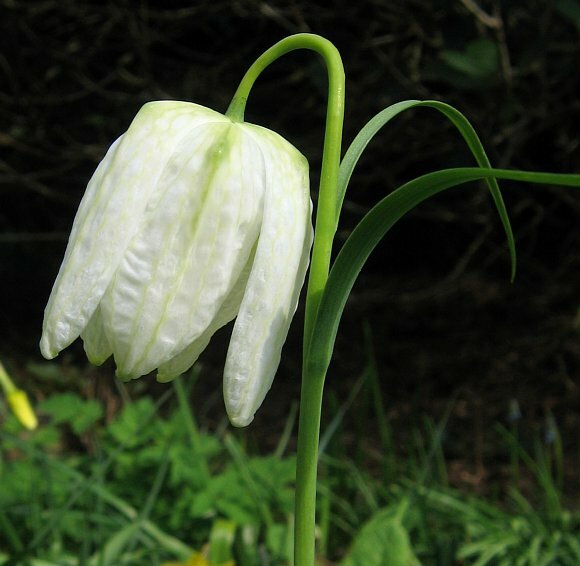 The tips of each petal have a small slightly hairy green rib. The sparse leaves are a little thicker than grass and greyish due to a covering in very short white woolly hairs. The stems are reddish and also have very short white woolly hairs. The seed-heads are sturdy and long, consisting of three tubular sections 'welded' together side-by-side. Each barrel has a slight crease on the outside to compartmentalise each barrel into two to contain the seeds. The seed case splits along the three less deep but more pronounced centre creases to release the ripe seeds. There are many varieties outside of the UK. 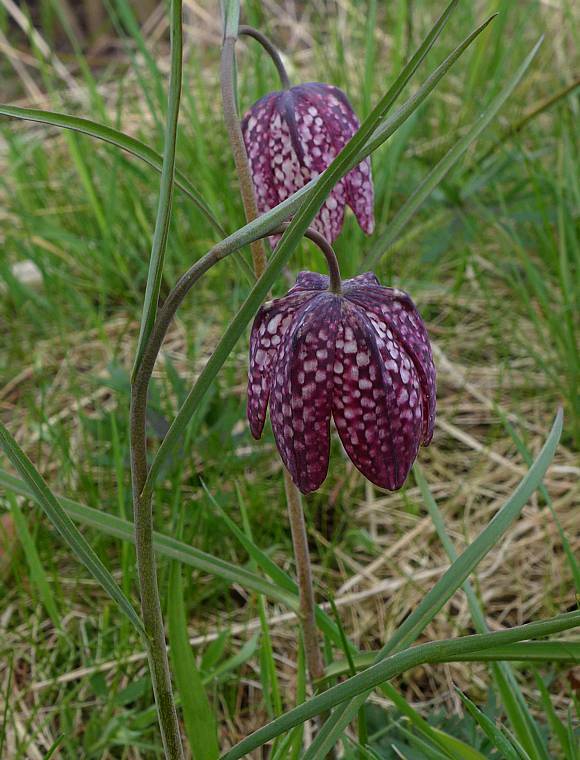 Uniquely identifiable characteristics: No other British flower has a chequerboard pattern on the drooping bell-shaped petals. Widely planted in gardens. Very rare in the wild. Magdalen Meadows in Oxford is probably the most famous place for them, for here they grow singly, widely spaced, over the whole meadow. Clive Stace says that it is doubtful if this is native, but others dispute that. Hence that Author has left the status blank. 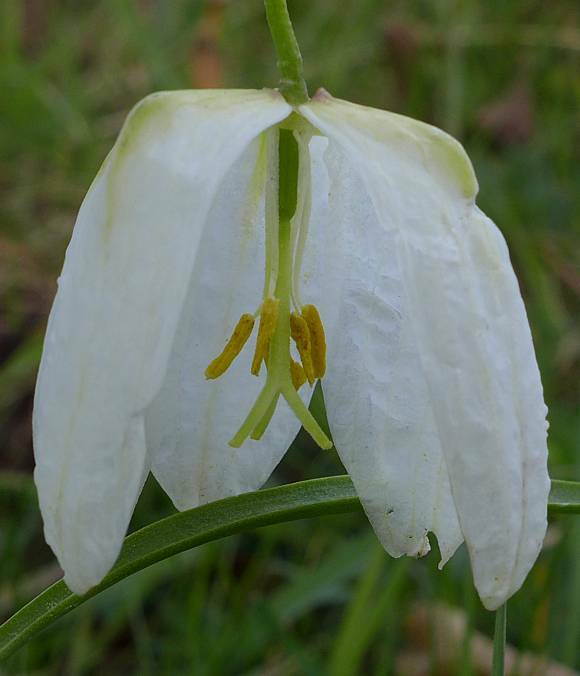 Although the flower appears bell-shaped, it is actually constructed of six folded petals, three on top and three staggered 60 degrees underneath. The whole flower hangs upside down. The leaves are grass-like, and linear. 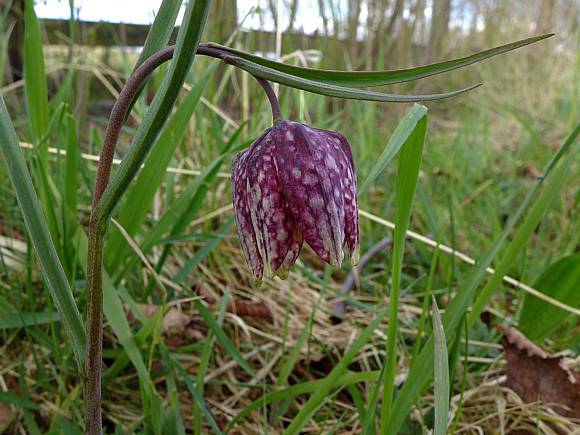 Snakes Head Fritillary is poisonous, containing Imperialine, Tulipalin A and Tuliposide A. Ingestion of the plant can lead to gastrointestinal tract disturbances and can adversely affect kidney function, inducing vomiting, spasms, hyptension and finally cardiac arrest. 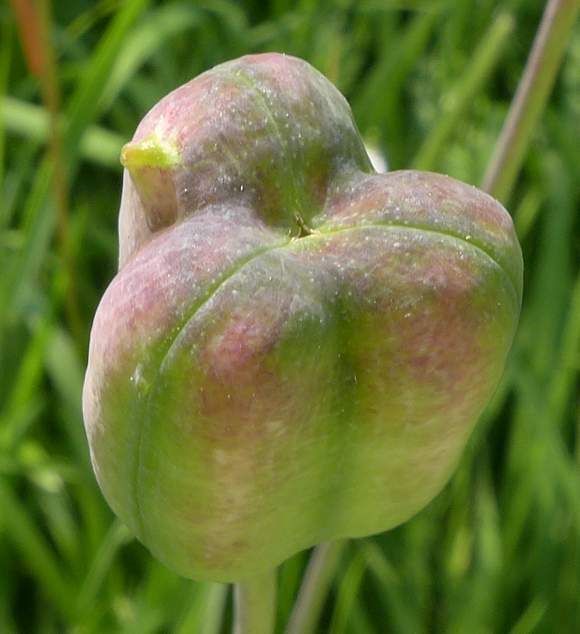 Allergic Contact dermatitis can result by handling the bulbs because of the Tulipalin A which it contains. 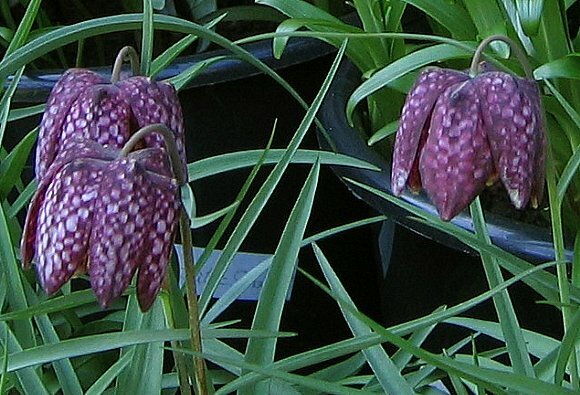 Snakes Head Fritillary [and other Fritillaries including Crown Imperial (Fritillaria imperialis)] contain Imperialine and other steroidal alkaloids, which resemble Aconitine in their biological activity. 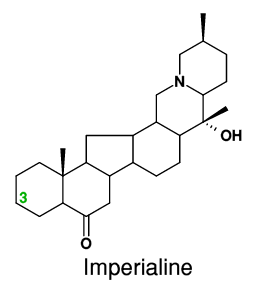 Imperialine (aka Pelminine) is an isosteroidal alkaloid which selectively blocks muscarinic M2 receptors in the heart, effective at 100µg/kg. A singly-chlorinated version, 3-β-chloro-Imperialine where the chlorine atom replaces one of the two hydrogen atoms at position 3 (shown in green), is ten times more effective in this role than is Imperialine itself and is used pharmaceutically. Imperialine is quick acting (15 minutes), but its effects are short lasting (30 minutes) [assuming one survives the encounter]. 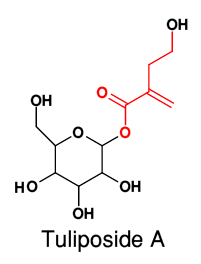 Tuliposide A is a glycoside, with the sugar unit ( glucose ) at bottom left and a side chain attached (top right). That part of the side chain (shown in red), becomes Tulipalin A when the Tuliposide is acted upon by enzymes within the plant, released on damage. 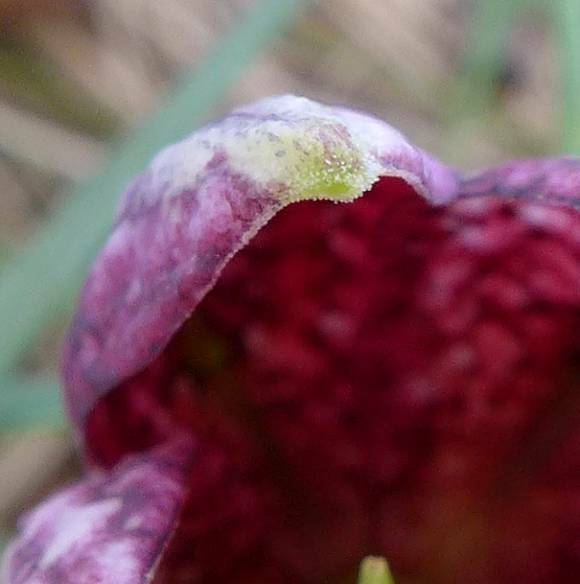 Tuliposide is present in many flowers of the Lily Family, but especially Peruvian Lily (Alstroemeria aurea), where it also presents handling hazards regarding contact allergenic dermatitis. The dermatitis is due both to Tuliposide A and to the decomposition product, Tuliposide A, which is released by enzymic attack on4 Tuliposide A, where the side chain folds up into a five-sided furan ring. All parts of the plant contain this allergen. 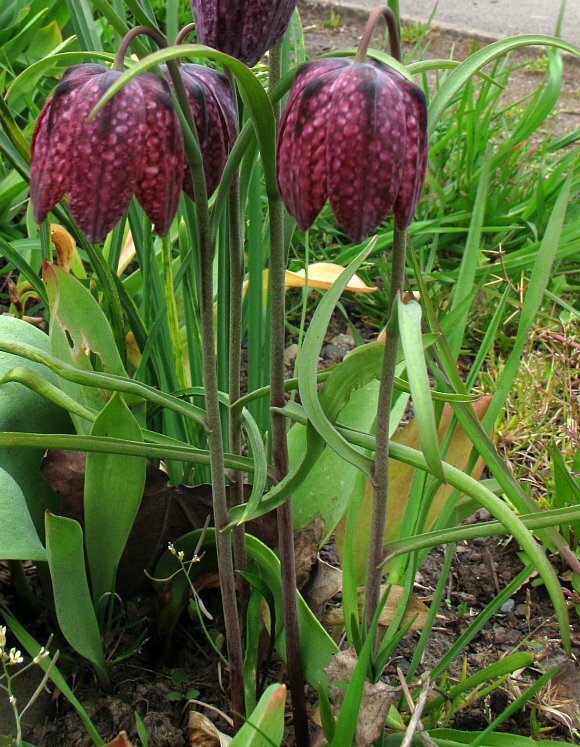 Experiments suggests that Tulipalin A and Tuliposide A may play a role in the germination of these bulbs. Tulipalin A (aka Securolide, Tulipnane and Tulipalin) are poisonous lactones similar to Protoanemonin. 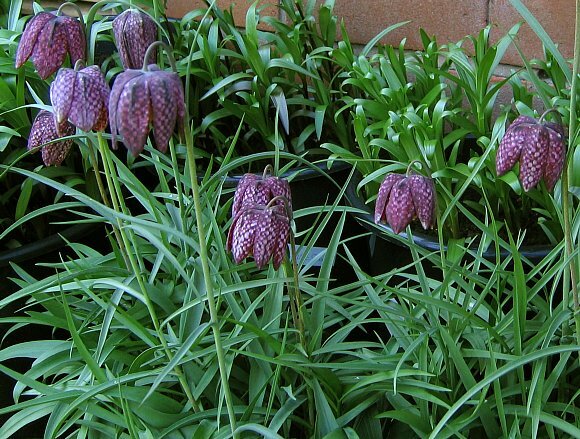 It is present not only in Fritillaries, but also Daffodils, Jonquils and some other members of the Lily Family. 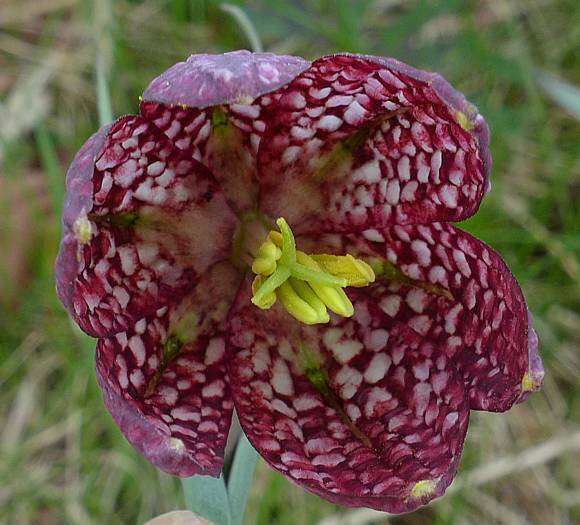 It is responsible for a contact dermatitis called variously 'Lily Rash' or 'Tulip Finger' which florists and gardeners are liable to contract especially when handling the bulbs of these plants. This toxin is released primarily when the bulbs are damaged, and is easily borne on the air as a vapour, which may also be responsible for airborne dermatitis. It is used pharmaceutically to treat peptic ulcers and irritation of the bowels. 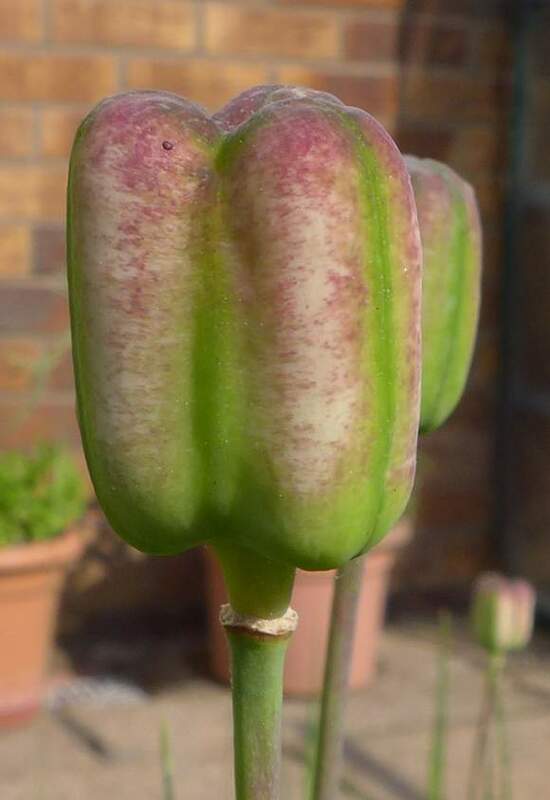 Tulipalin A also exhibits insecticidal properties. Both Tuliposide A and 6-Tuliposide A (not shown) are biosynthetic pre-cursors to Tulipalin A. Both Tulipalin A and Tuliposide are toxic if ingested, resulting at first in lethargy and vomiting followed by extreme thirst and the drinking of much liquid, culminating in severe kidney damage from which death may result. Cats are especially vulnerable, they seem to have a much reduced tolerance of the chemicals (their LD50 is much lower). Both Tulipalin A and Protoanemonin posses a highly reactive extra-cyclic methylene group (the double bond ending in two hydrogen atoms). This methylene group can form covalent bonds with free SH groups found in proteins or in the amino acid Glutathione, resulting in allergenic and cytotoxic effects. Both Tulipalin A and Tuliposide have anti-fungal and anti-bacterial properties, and both are cytotoxic.